Gavrilenko M.G, Ozerov A.Yu. 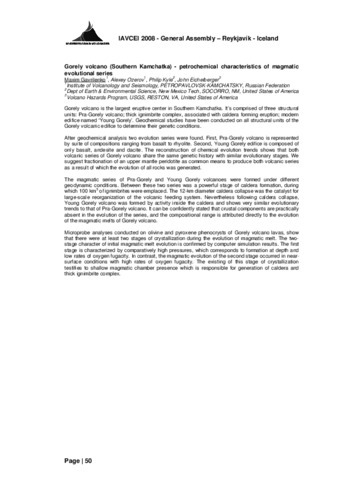 Petrochemical Characteristics of Gorely Volcano (Southern Kamchatka) Magmatic Series // “CoV6-Tenerife 2010” – Cities on Volcanoes 6, Puerto de la Cruz, Tenerife, Canary Islands, Spain May 31 - June 4, 2010. 2010. 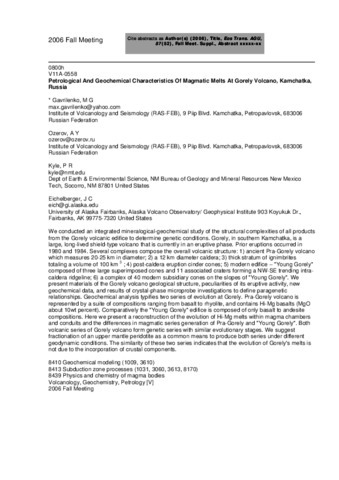 Gavrilenko M.G., Ozerov A.Yu., Kyle P.R., Eichelberger J.C. Petrological and Geochemical Characteristics of Magmatic Melts at Gorely Volcano, Kamchatka, Russia // AGU Fall Meeting 2006. Eos Trans. AGU, 87(52), Fall Meet. 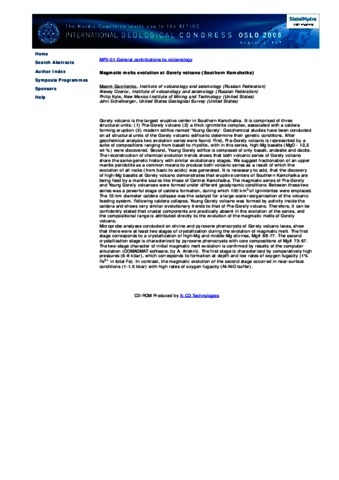 Suppl., Abstracts. 2006. P. V11A-0558. A series of large caldera-forming eruptions (361–38 ka) transformed Gorely volcano, southern Kamchatka Peninsula, from a shield-type system dominated by fractional crystallization processes to a composite volcanic center, exhibiting geochemical evidence of magma mixing. Old Gorely, an early shield volcano (700–361 ka), was followed by Young Gorely eruptions. Calc-alkaline high magnesium basalt to rhyolite lavas have been erupted from Gorely volcano since the Pleistocene. 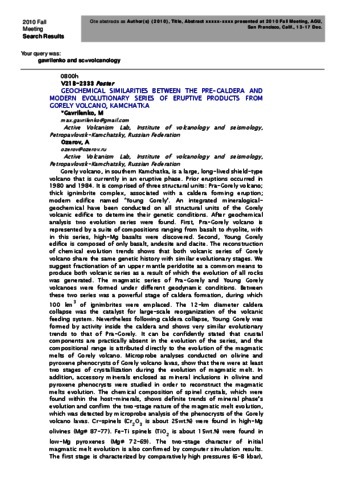 Fractional crystallization dominated evolution of the Old Gorely magmas, whereas magma mixing is more prominent in the Young Gorely eruptive products. 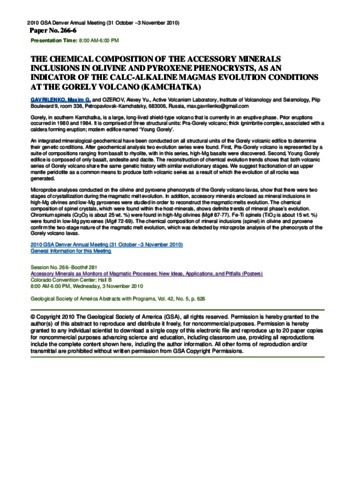 The role of rechargeevacuation processes in Gorely magma evolution is negligible (a closed magmatic system); however, crustal rock assimilation plays a significant role for the evolved magmas. Most Gorely magmas differentiate in a shallow magmatic system at pressures up to 300 MPa, ∼3 wt% H2O, and oxygen fugacity of ∼QFM + 1.5 log units. Magma temperatures of 1123–1218 °C were measured using aluminum distribution between olivine and spinel in Old and Young Gorely basalts. 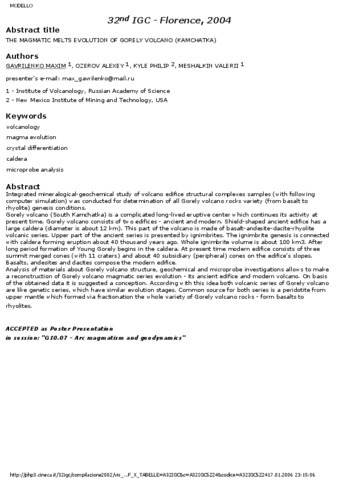 The crystallization sequence of major minerals for Old Gorely was as follows: olivine and spinel (Ol + Sp) for mafic compositions (more than 5 wt% of MgO); clinopyroxene and plagioclase crystallized at ∼5 wt% of MgO (Ol +Cpx + Plag) and magnetite at ∼3.5 wt% of MgO (Ol + Cpx + Plag +Mt). 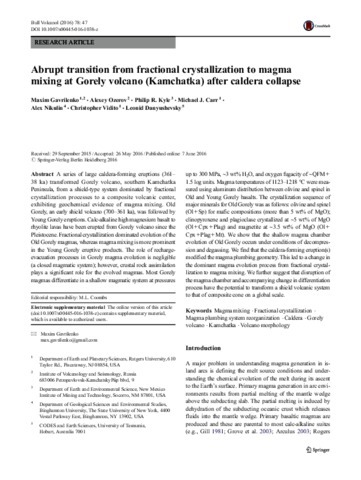 We show that the shallow magma chamber evolution of Old Gorely occurs under conditions of decompression and degassing. We find that the caldera-forming eruption(s) modified the magma plumbing geometry. This led to a change in the dominant magma evolution process from fractional crystallization to magma mixing. We further suggest that disruption of the magma chamber and accompanying change in differentiation process have the potential to transform a shield volcanic system to that of composite cone on a global scale. 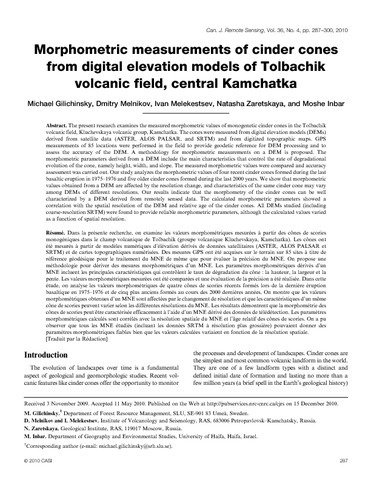 Gilichinsky Michael, Melnikov Dmitry, Melekestsev Ivan, Zaretskaya Natasha, Inbar Moshe Morphometric measurements of cinder cones from digital elevation models of Tolbachik volcanic field, central Kamchatka // Canadian Journal of Remote Sensing. 2010. V. 36. V. 4. P. 287-300.